The 10 Best Museums in the State of Washington! It's quite the challenge to narrow down this list to just 10 fascinating museums in Washington, because the list should go on much further. From the Bug Museum to the Last Resort Fire Department, from a telephone museum to a pinball museum, the state has displays for every taste. It is definitely hard to choose just 10, but here's a selection of art, history, tech and culture that have won kudos from every member of the family. Bill Boeing started his company in a small red barn. That is now one of the many exhibit areas for the Museum of Flight in the south end of Seattle, close to Boeing Field and the company's Seattle workplace. The museum, which is the largest aviation museum on the West Coast, has hundreds of planes on exhibit, from biplanes to the latest in jets. It even has a replica of the International Space Station, full size. Beside planes, it has a flight simulator, hands-on learning areas and tours of Boeing Field. The Maryhill Museum, in Goldendale in Eastern Washington, has one of the most unlikely settings you could imagine. It sits high above the Columbia River, easy to see in the rural landscape. The building was the mansion of pioneer Sam Hill. It features many sculptures by Auguste Rodin, Romanian furniture and artifacts courtesy of Queen Marie of Romania and a recreation of Stonehenge. It is well known for its large assortment of Indian bowls, baskets, knives and other artifacts. The Seattle Art Museum includes the main building downtown, plus the Asian Art Museum at Volunteer Park and the Olympic Sculpture Park on the waterfront. It has numerous permanent collections, as well as major touring exhibitions. The Asian Art Museum, located in a park close by downtown, shows collections covering centuries of Asian works. The Olympic Sculpture Garden displays a wide variety of sculptures in an area spread out over nine acres along the Seattle waterfront. The Northwest Museum of Arts & Culture, located in Spokane in Eastern Washington, is run by the Eastern Washington State Historical Society. An affiliate of the Smithsonian, it shows off a wide range of Northwest memorabilia. The displays include regional history, American Indian culture and fine arts in the area. 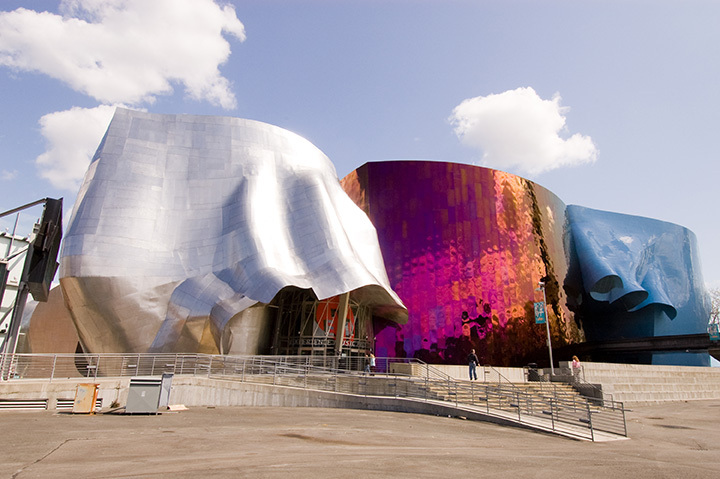 Sometimes called the Jimi Hendrix Museum, the EMP Museum is a rock symphony of popular culture and alternative music. The museum uses music, interactive displays, oral histories and more to illustrate and bring contemporary culture to popular attention. The Children's Museum of Tacoma is all about play for children under eight years of age. It's highly interactive, letting children pretend they are pioneers in the fort building, control the waterfall in the water area, or making works of art in the studio. At various times they have had a STEAM studio, a place to create objects that move through a wind tunnel, and a holiday Gingerbread Jamboree. Located in Seattle and started by Paul Allen, Microsoft co-founder, the Living Computer Museum is a gem that features "ancient" computer technologies going back three or more decades. It has a wide range of early computers on display, restored and working. The museum houses seven mainframe computers from years gone by, 10 minicomputers and 45 microcomputers, all cutting edge in the days before the internet. Located in Keyport, the U.S. Naval Undersea Museum takes visitors on a tour of the Navy's undersea operations. These include torpedoes, diving and salvage, submarines and unmanned underwater vehicles. Its wide range of maritime exhibits and military history collection are all related in some way to undersea operations. Exhibits include a Confederate mine and the Deep Submergence Rescue Vehicle, built for the movie "The Hunt for Red October." The Museum of History and Industry, located on Lake Union, offers ¬several floors of displays that illustrate the history of Seattle, Puget Sound and Washington State during the decades. It has numerous hands-on exhibits and an amazing collection of photos of early Seattle. The collections range from the Great Fire to the Klondike Gold Rush and the start of Boeing. It has a popular display of hydroplanes, an integral part of Seattle's annual Seafair celebration. The Pioneer Farm Museum in Eatonville is an interesting spot for kids and adults. It keeps the state's rural past alive with displays that show how people lived in the 1800s. Kids love the fact that they can dress like pioneers, do farm chores and even jump in a pile of hay. The museum also has the Ohop Indian Village that shows how Indians lived in times gone by.